Node continues to remain as a leader in asynchronous framework market, the platform now supports a huge portion of startups and businesses that are earning hundreds of millions of dollars in revenue, establishing itself as a platform that can sustain huge load, whilst retaining smooth performance. Node.js was perhaps the biggest revelation of modern server engineering that we saw, and by the looks of it — Node isn’t stopping any time soon, it’s the exact opposite; the project continues to push out frequent updates, and maintains old releases to support older platforms. It’s one of those frameworks that you can be proud of using. A new release has been published that secures some loopholes in OpenSSL, but also adds more support for languages like C and C++. 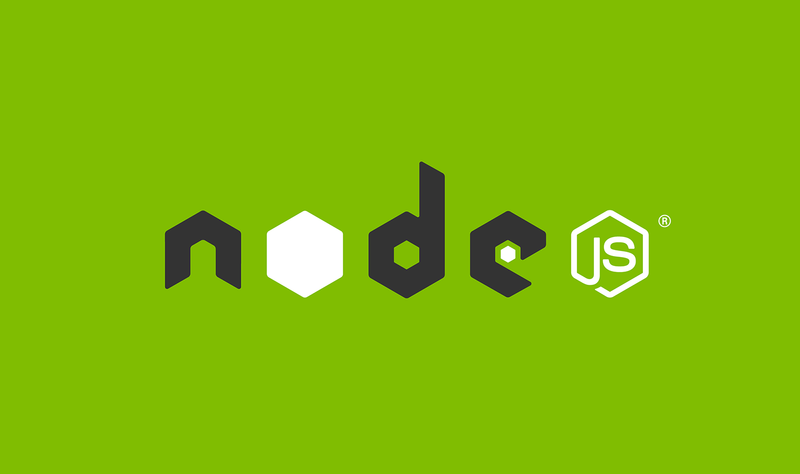 Starting with Node.js these days is a fairly easy process, the guidelines are outlined, and thousands of projects are sitting on GitHub, waiting on you to inspect them, and analyze their architecture. Node.js works great on all platforms, even Windows 10 for those who are interested, which makes it a truly great platform to begin learning front-end and back-end development together. 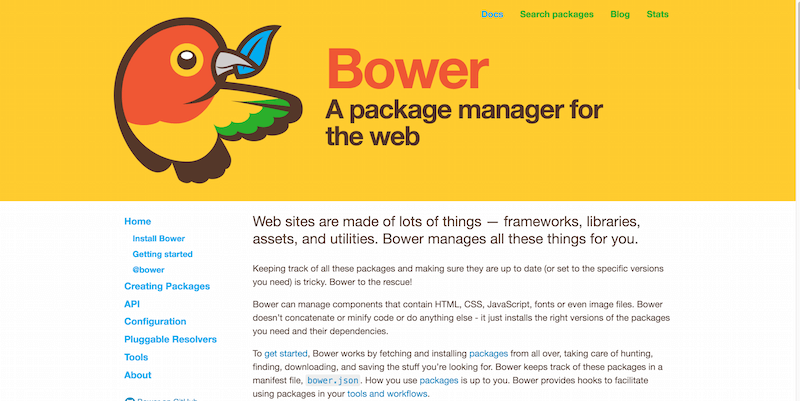 Let’s not forget that Node has the most populated package manager of any framework or language known to man, so building a website takes only a couple of minutes, thanks to the plethora of modules and libraries that are available through the package manager — even technical websites/platforms, such as analytics dashboards can take up only a few hours of your time to have a fully functional version up. APIs are another thing Node is so well known about, because it promises near real-time performance, and in many cases actual real-time performance, Node is dependent on APIs to provide smooth data transitions from one place to the other, tutorials for creating APIs for Node exist already, so does tutorials on how to design an API for Node, and it always helps to learn a little bit more about the command line and how Node works with it. 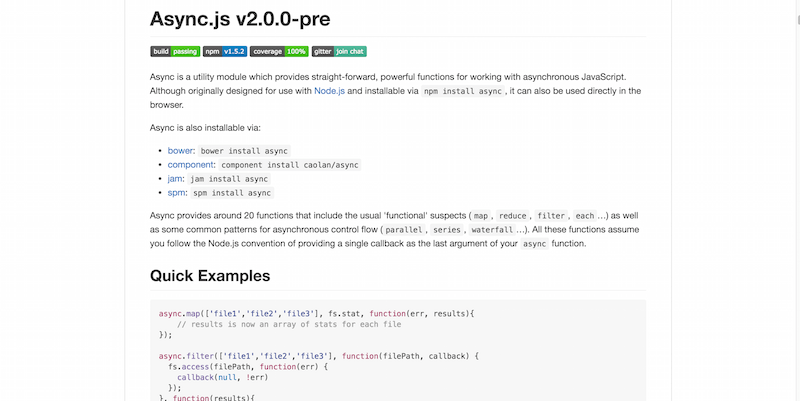 Of course, we are just helping to spread the word about some neat Node resources, we did write a little while ago about the most popular Node frameworks that developers recommend this year. Let’s keep the doors of learning open, while switching our focus from learning, to exploring the best NPM packages, and also the best Node.js libraries to kickstart your development workflow. The libraries/packages/modules you will see us mention, will range from complex/simple frameworks, to libraries that can be used to do specific server-side and client-side tasks, we will also mention a couple of task managers, and tools of similar range. There are so many choices to pick from, so we tried to keep it legit and only include what matters to developers who want to get started with Node, and not waste any time weeding through tutorials. All common programming languages share similar structures in the way things are built, one of the fastest ways to get a programming language to serve your needs, is through a framework. 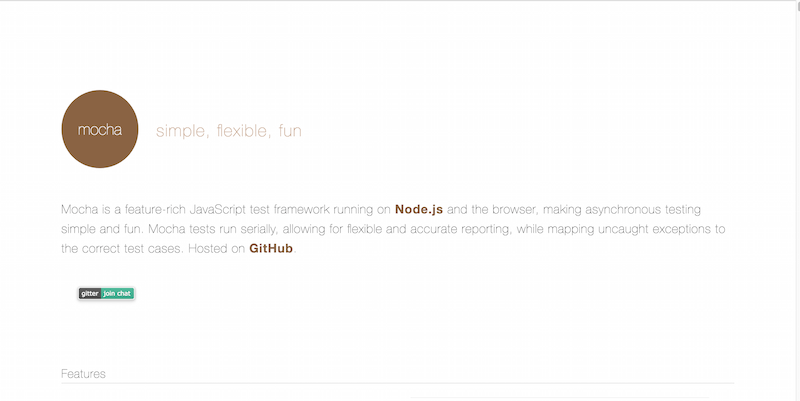 Express is the leading Node.js framework for quickly creating and publishing applications, and APIs. The frameworks minimal structure allows any Node.js developer to quickly launch a functional application with the use of Express Generator. 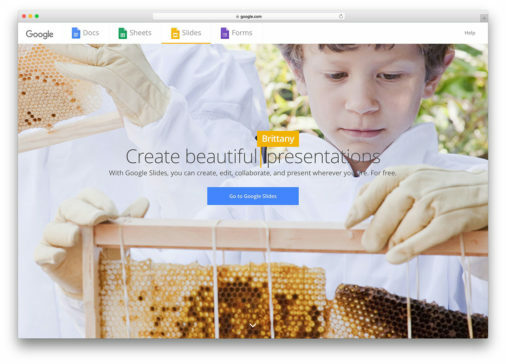 The rest is up to you, as Express gives you a solid outline to build your apps on top of. Combine it with any of the other packages we will discuss, and you will quickly realize just how amazing this framework truly is. Apps constantly have to deal with external HTTP calls, whether to fetch data, or to load data directly from an external source. 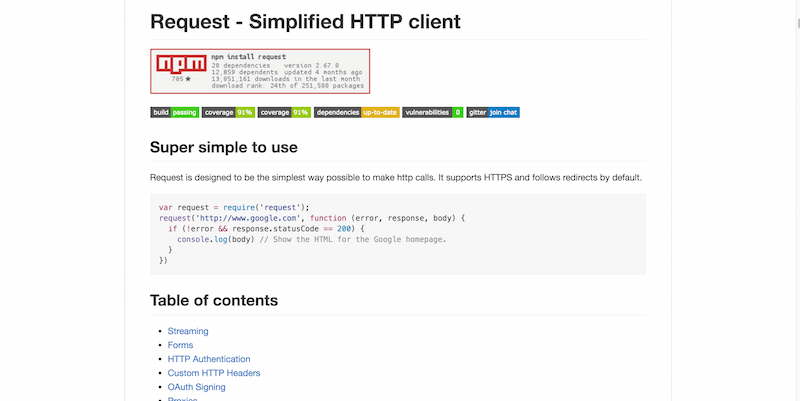 Having a reliable way to do HTTP calls is essential, which is why Request has grown to be the most reliable HTTP Client library of them all. With Request, making HTTP calls becomes an easy, secure, and reliable way of accessing external content on the web, in any form imaginable. It works well with authentication methods too. Task runners can be avoided for as long as you like, but learning one is going to completely change your programming experience, from day one. With a task runner, you can easily allow yourself to have less tasks to care of for a particular project, and instead automate the process of doing minifications, compile tasks, testing, code linting, and so forth. The less of these you have to do individually on your own, the more time you have to spare for doing actual coding work. 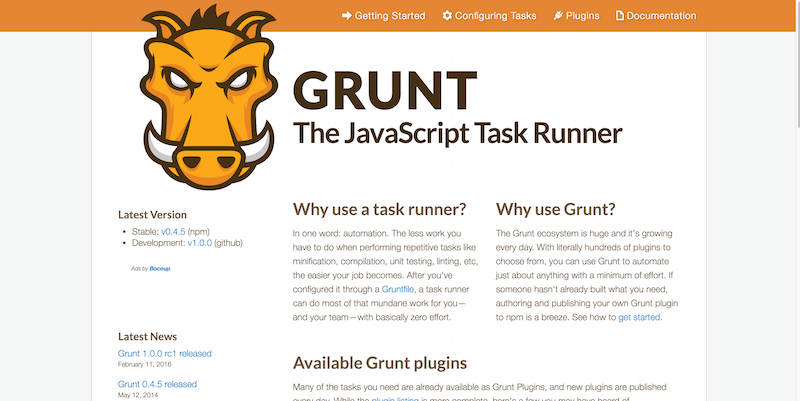 Grunt provides a ton of plugins that you can use to automate even the most mundane tasks, without any extra effort from your side. And if you feel that there isn’t a plugin that does what you need, well.. just go ahead and create your own, Grunt lets you publish Grunt-specific plugins through NPM. 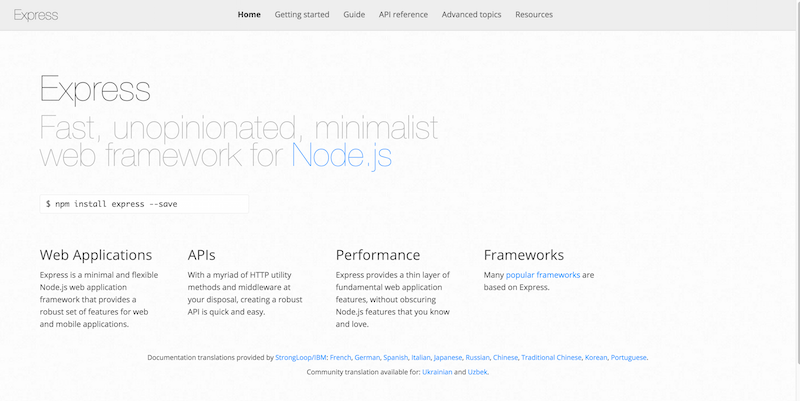 Node.js is known for being the framework to use for scaling large applications, and infrastructure. Process management should be an essential priority for any Node.js user. 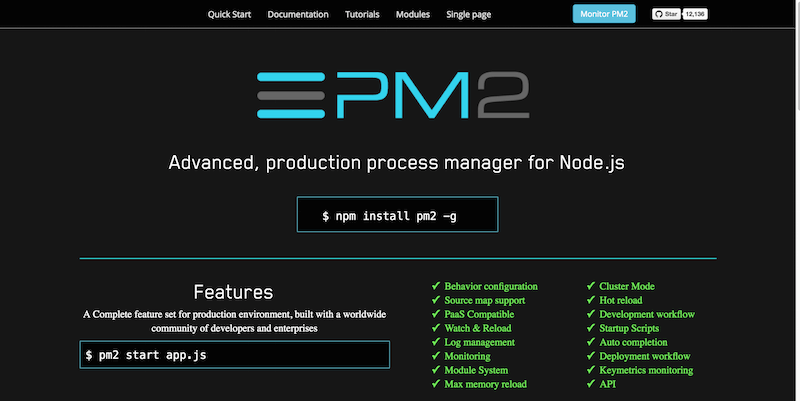 PM2 offers both process management for production applications, and a load-balancer to help with any possible performance tweaks. With PM2, your applications stay online indefinitely, giving you the tools to reload apps without having to experience any sort of downtime. 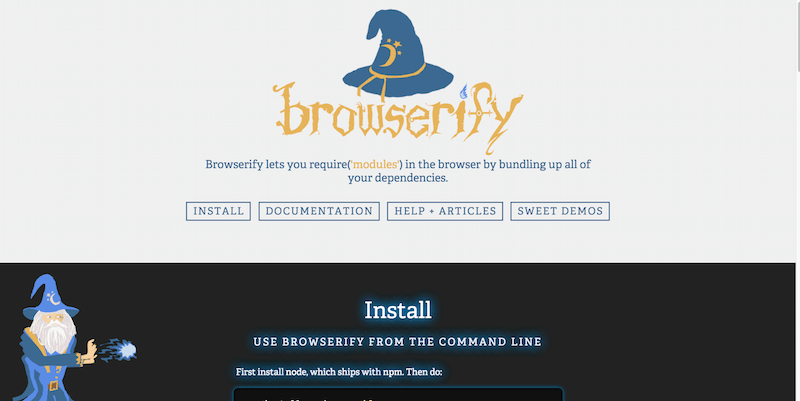 Is it a surprise that hundreds of thousands of Node.js users consider this an essential tool to have? 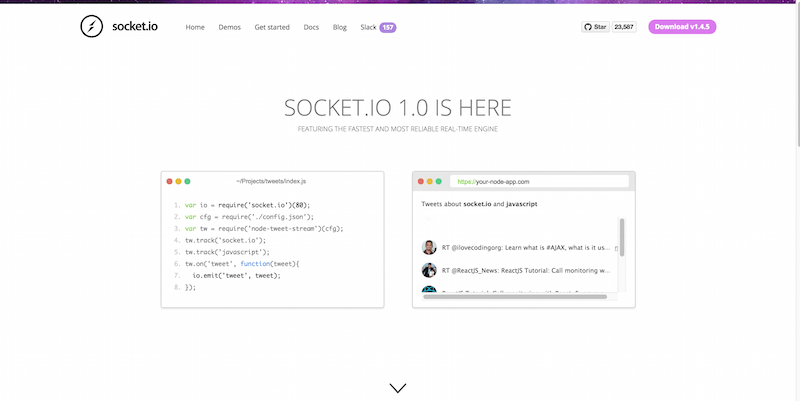 Socket lets you build truly real-time communication apps that would require real-time streams of content, whether directly from the data that you are working with, or through an API that comes from an external source. Some example apps that we have seen is a Twitter bot for collecting latest tweets, a Facebook bot for watching news, and other interesting combinations of APIs that work with data in real-time. Just imagine what such communication methods could do for your analytics, truly real-time analytics are still being actively developed even by large companies such as Google Analytics, but with Socket — you just happen to get early access to all that. 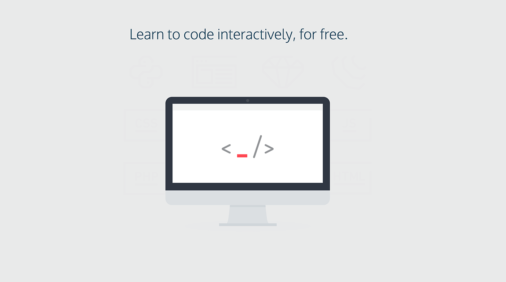 Want to craft an app or a project that requires command-line interface? Worry no longer, Commander.js (based on Ruby) is a great solution for creating command-line interfaces without any fuss. Underscore is popular amongst developers who enjoy more rapid development workflow through the use of programming helpers. 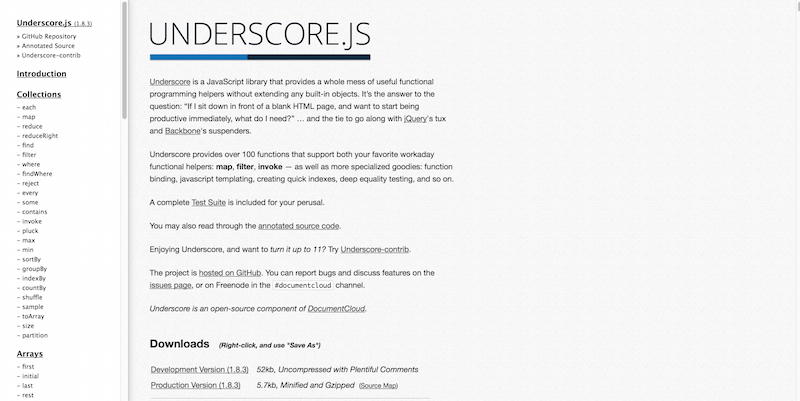 With more than 100+ helpers to choose from, Underscore bridges the gap between opening a new HTML document and writing code for it, without the need to think how complex functions operate. 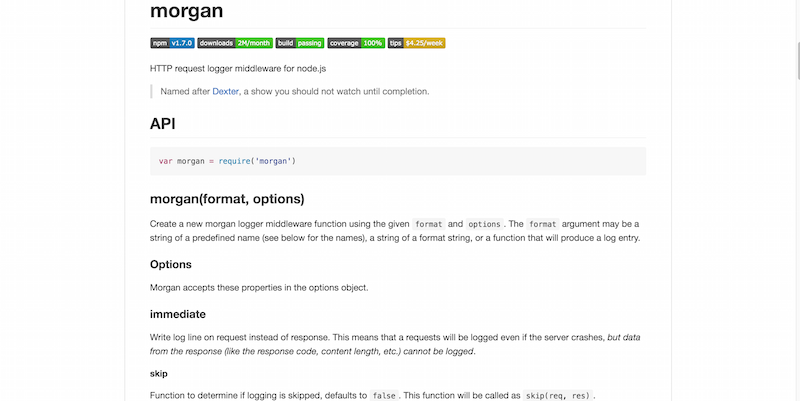 Want to use jQuery within the server-side of things? Now you can with Cheerio. 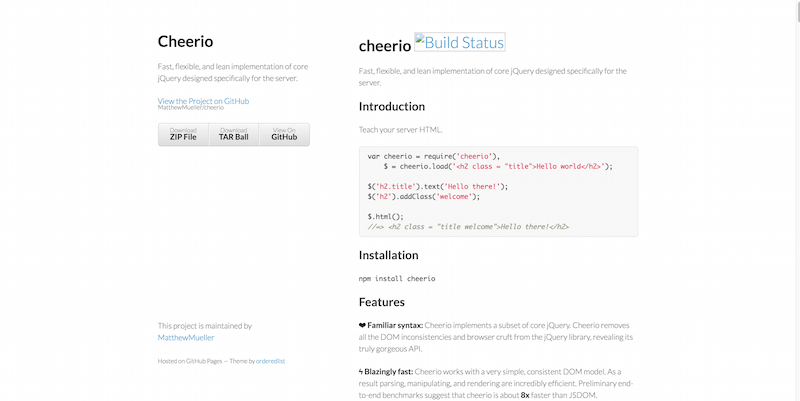 Cheerio is a fast, flexible, and lean implementation of core jQuery designed specifically for the server. 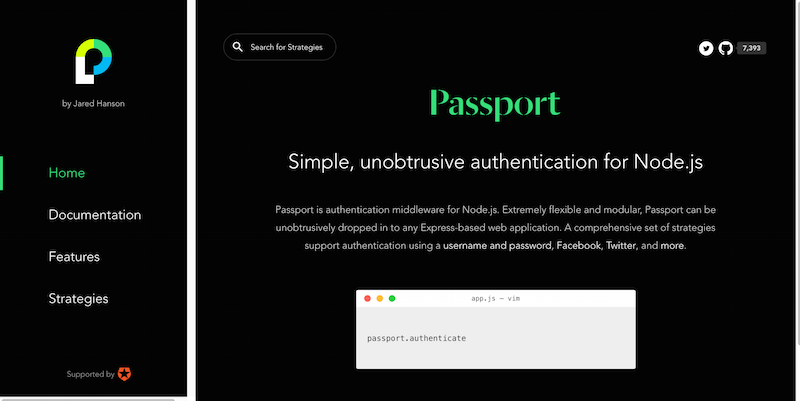 Passport is a unique authentication module for Node.js devs. The main goal of Passport is to help with authentication requests, this Passport achieves through the use of third-party plugins that act as authentication methods, otherwise known as strategies. The Passport API is straightforward, you give Passport a request that you need to authenticate, the Passport in turn gives you the hooks that let you control what happens after an authentication call fails, or succeeds. Exploring the Strategies, there are hundreds of authentication methods to choose from, starting from internal ones, all the way up to external ones like Google, Facebook, and others. Sending email is one of the most sensitive things that you will do with your apps. Email is a big deal, and having a secure way of doing email transactions is essential to your reputation. 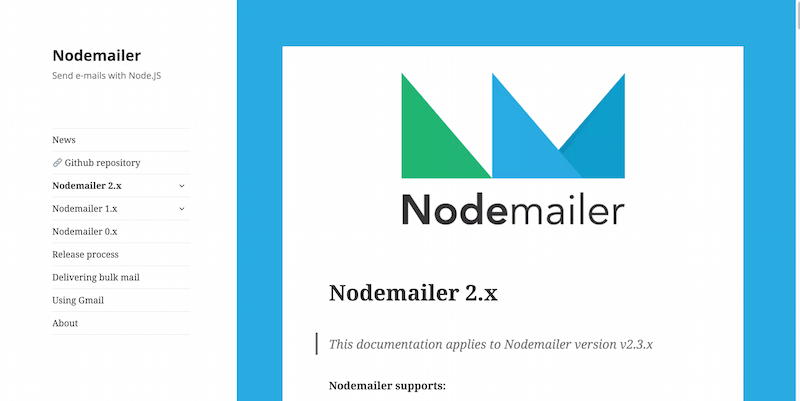 That’s why they built Nodemailer, a secure framework for doing email management within your Node.js applications. Documentation provides extensive amounts of samples on how to get Nodemailer to work with SMTP. 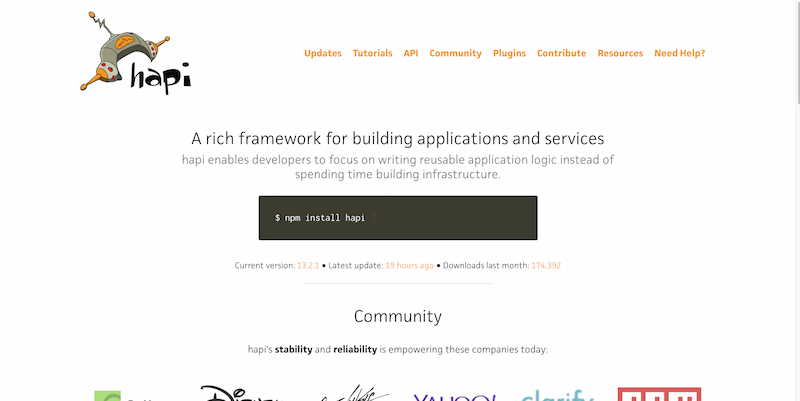 Hapi is a server-framework that will happily assist you in building apps, and services. With Hapi, you can put all of your focus towards writing the application logic, with a very concise approach. Hapi isn’t just another wannabe framework either, leading technology companies today rely on Hapi for stellar performance results. Hapi can be used to build robust APIs, to handle high-load projects that need to scale, and Hapi delivers the kind of modular design that helps to align your project together. Flexibility is key in development, and Hapi gives you all the flexibility you could possibly ask for. Testing, testing and more testing! We need to test our apps to ensure their stability and performance, and we need the right tools for the job. Karma is one such tool that does the job of testing beautifully. 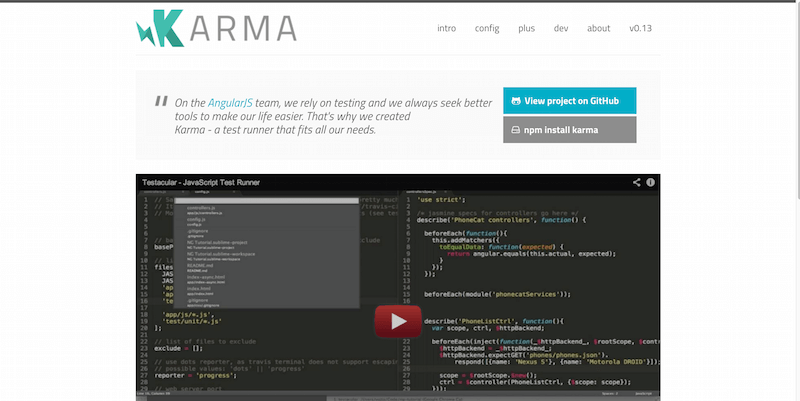 The reasons to use Karma are long, some of them include: ability to test your code in the browser, but also cross-browser. You can use Karma to launch test during local development, during server integration, and during every file save you do. It works flawlessly in the terminal, so terminal-lovers — rejoice! 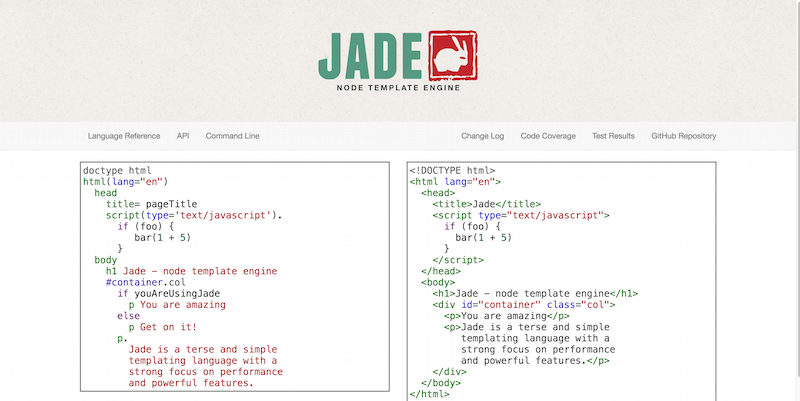 Formerly known as Jade (although still using old website), Pug is a node templating engine. 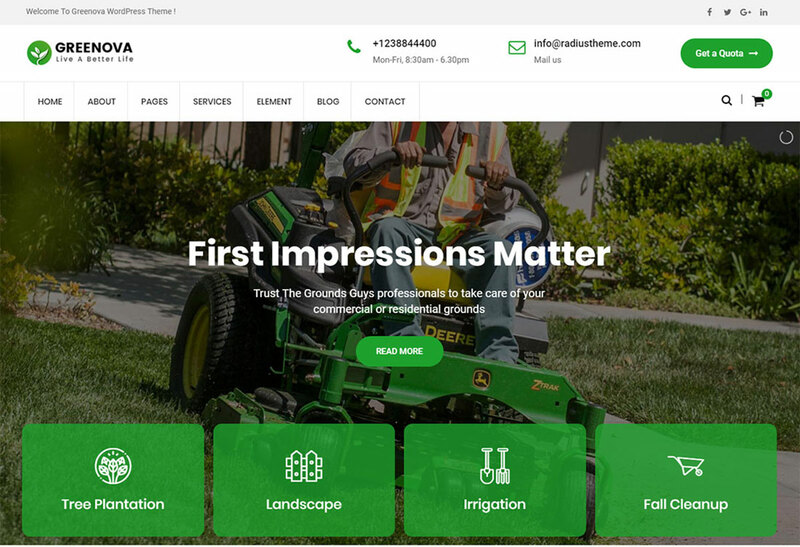 What is a templating engine? Well, it’s the kind of an engine that helps you to eliminate the need for writing complex HTML and JS code that could otherwise be shortened down to a more slim, more compact version. That’s what a templating engine is. 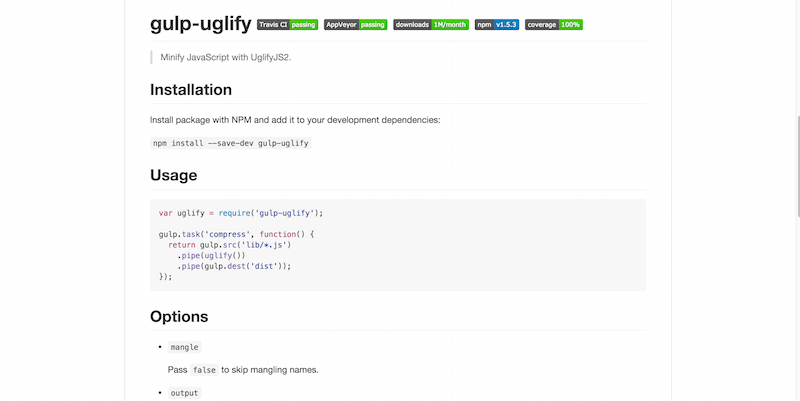 Pug has been crafted specifically for Node, so you will be getting a lot of benefits and recognizable patterns, all to help you be more productive and efficient while working. MySQL, the world’s most recognized database server. Where would the world be, if it wasn’t for MySQL and all that it has brought about. True, in modern development, many choose to go for more simple database servers, like MongoDB, but to deny popularity of MySQL; it’s just pure ignorance. The Node MySQL library is a native implementation of the MySQL Protocol for the Node.js JS Client. GitHubbers are starring this one faster than we can blink, get it on the party wagon! 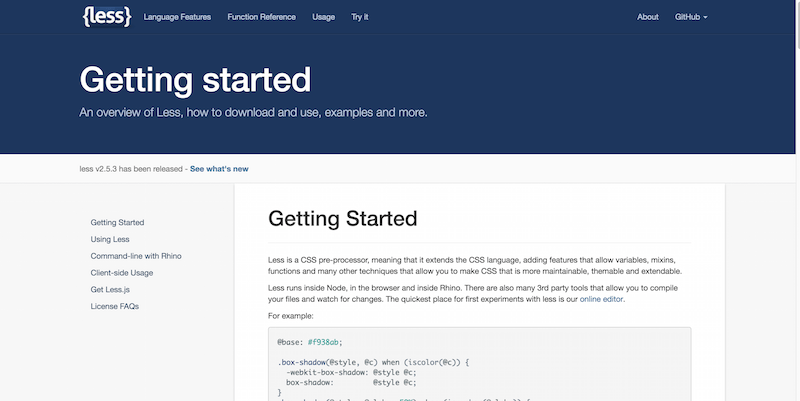 LESS is a recognized and reputable CSS pre-processor that significantly improves your CSS workflow, and overall front-end development experience. 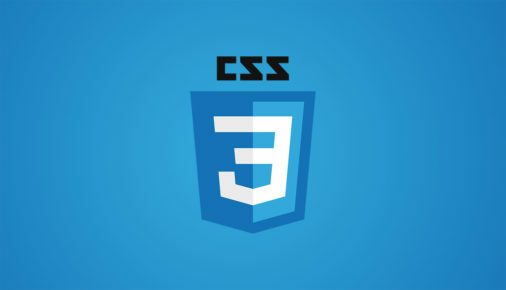 Pre-processors transform CSS to act more as a programming language, rather than just a scripting environment. Many reasons to choose LESS, but most important one: it’s free, it’s reliable, and hundreds of thousands of developers use it daily. As we mentioned, MySQL is very popular amongst database managers, but so is MongoDB. 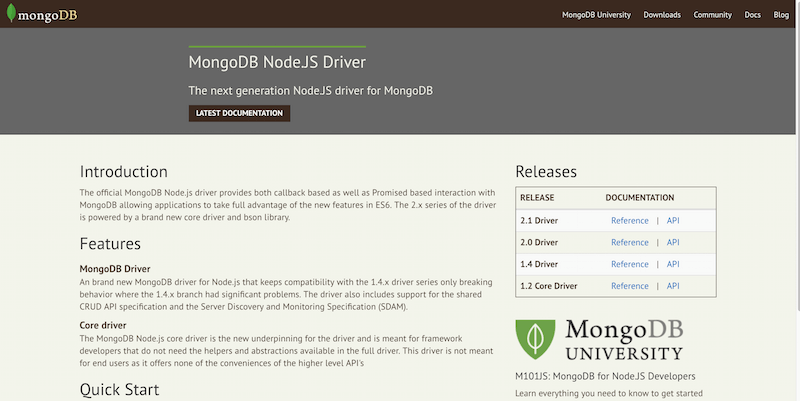 This library will provide a necessary driver for those who wish to implement a full version of MongoDB within their Node.js projects. 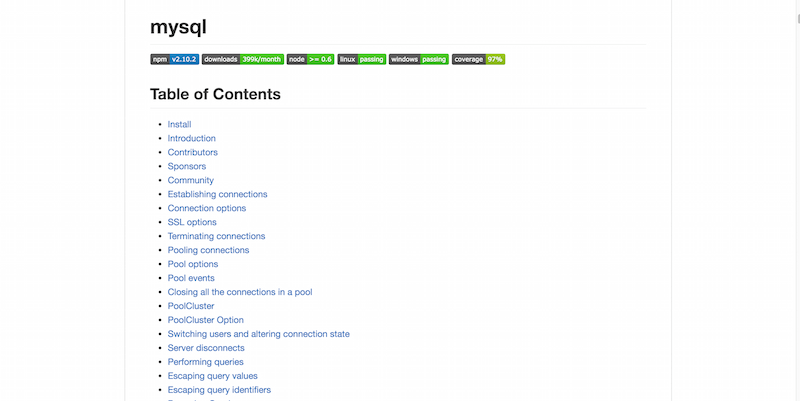 This will give you the necessary room to use MongoDB to its full potential within your Node projects. 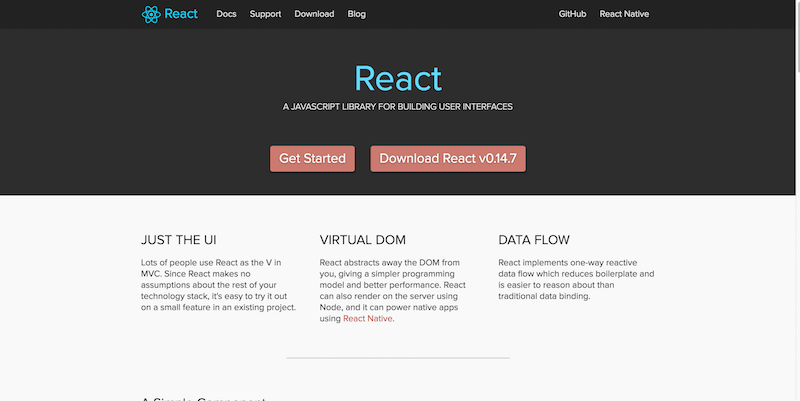 With millions of downloads each month, Morgan is one of the top priority libraries for Node devs. Morgan is a HTTP request logger, storing HTTP requests and giving you concise insight into how your app is being used, and where there could be potential errors or other issues that you haven’t yet explored. Easily the most reliable HTTP logger known to the Node.js community. WebPack lets you use dozens of modules in your project, without having to worry about their locations and overall performance. 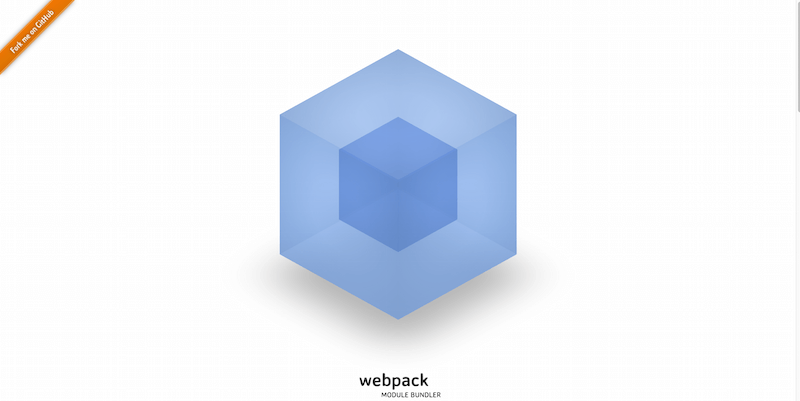 WebPack, as the name suggest, packs all your modules in separate JS, CSS, and HTML files and gives you back an easy workspace for the browser. You can split, bundle and allocate code as you like thanks to WebPack. What’s the best framework for rapid app building? Many will argue, but for many, Angular will sit at the top of the decision. 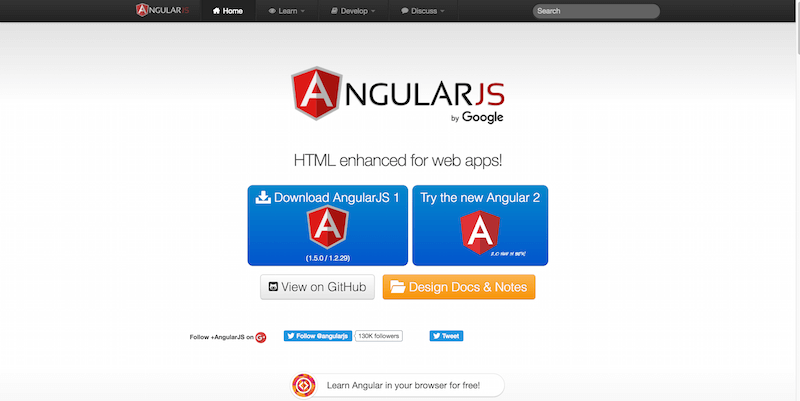 Angular.js allows its users to build fast client-side web apps that would resemble a modern browser. Angular has a certain vibe to it, it makes the process of building rich-and-modern web applications so easy, yet so flexible, that it leaves you wondering… what were you doing without this framework all this time. APIs remain as one of the most important parts of any Node.js application, it’s what makes the real-time actually become real. If you are looking to build a RESTful API, then Restify library will give you the quirks and tools required to perform the task. 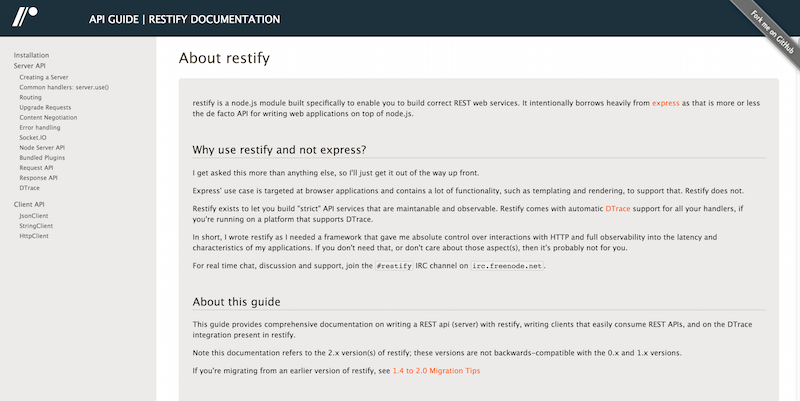 In more ways than one; Restify is the library you will want to use when building REST services for the web. It’s simply that good. 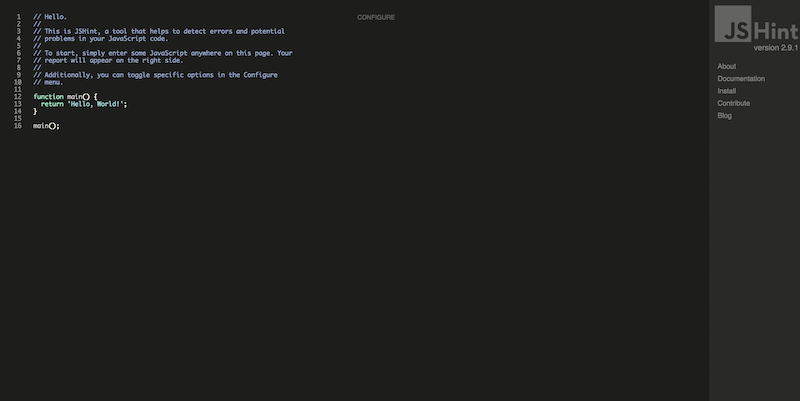 Markdown is a minified, more elegant, version of HTML. 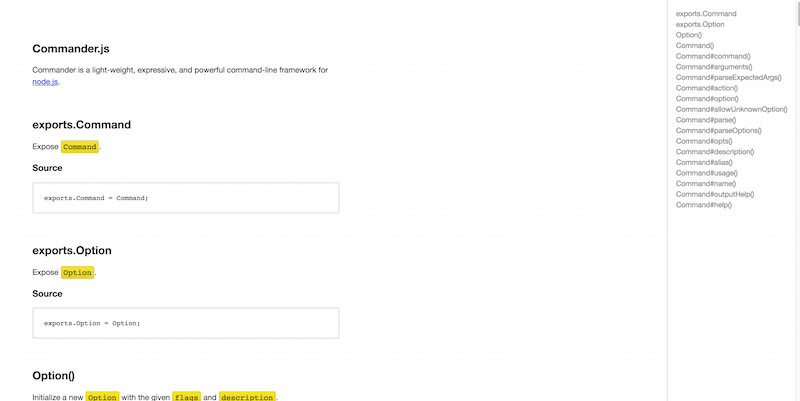 Markdown lets you convert text to HTML by using specific markdown syntaxes and tags. While HTML focuses on making everything appealing to the web, Markdown on the other hand wants to put the focus on text, specifically on the way text is presented, and how to best help online editors to output beautiful text, with less trouble and learning of HTML. 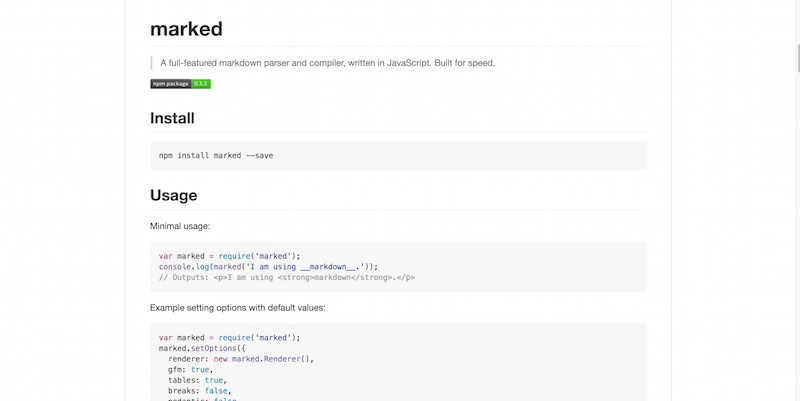 The Marked Node.js library will implement Markdown in any project, app or website that you’re working on. GraphicsMagick and ImageMagick are two highly acclaimed tools for manipulating visual content on the web. 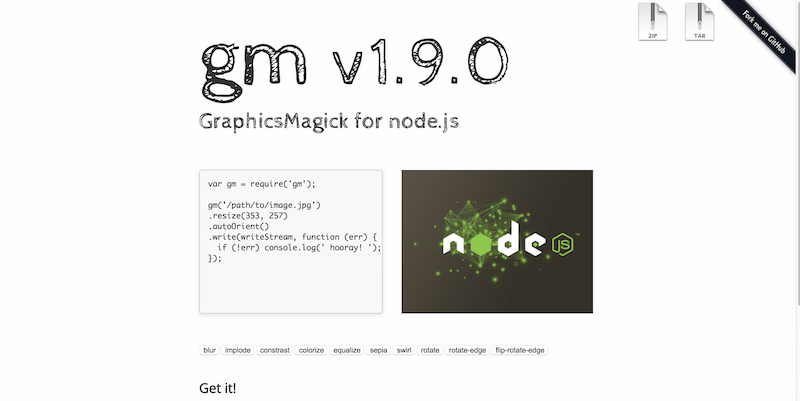 Now, you have the chance to use both GraphicsMagick and ImageMagick within your Node.js projects to optimize visual content as you go. Easy to navigate documentation offers all the insights, tips and tricks to help you get started with the GraphicsMagick library right away. 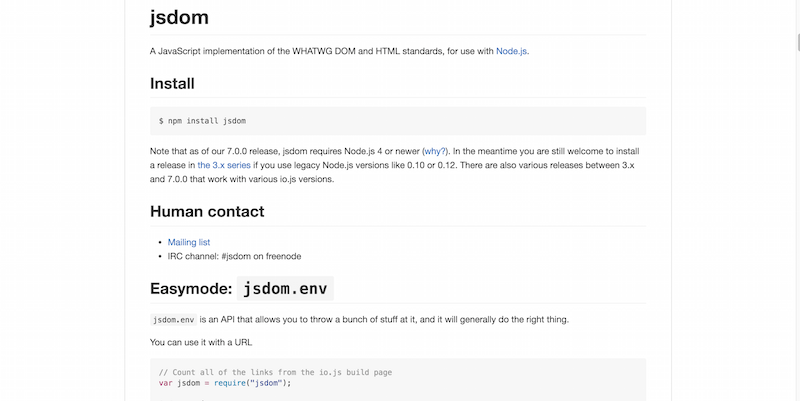 JSDOM helps to implement the WHATWG DOM and HTML standards within your Node.js architecture. Simple as that. What’s best for one, is the worst for other. Or the saying goes.. It wasn’t our intention to try and please a specific group of Node.js developers, instead, we chose to go the long way, and really explore packages that are heavily sought after, but also heavily useful for a project of any kind. So many of the libraries we explored, can be used directly together to secure a decent starting base for your next project. Security, flexibility, workflow, productivity, extendability, we feel these are the keywords that best represent the packages that we have explored here, and if you happen to just be a Node.js developer — we welcome you to leave a comment down below, sharing your insights about Node, and your most favorite Node packages that you feel you cannot live without in your daily Node dev environment. Thanks, and see you at the next Node resource we decide to publish. underscore is a good choice. Much better than lodash.